Home » Football News » Will Chile's Argentine coach upset his home country in the Copa America final? Will Chile's Argentine coach upset his home country in the Copa America final? Will Lionel Messi's Argentina come out on top in the #CopaAmerica final? Or will Chile have the last laugh? Hosts Chile stand in the way of a record-equalling 15th #CopaAmerica title for Argentina. For Argentina, it has been a 22-year-old wait for a major title. The South American giant last won a major competition in 1993, when they lifted the Copa America title in Ecuador. Come Saturday, the Lionel Messi-led team has a chance to end that long wait, as it is only Chile that stands between Argentina and a record-equalling 15th Copa title. A year after losing the World Cup final to Germany, the Gerardo Martino-coached side will be desperate to avoid defeat in its fifth major final in 11 years. The biggest influence behind the current Chilean side is inspirational coach Jorge Sampaoli. Argentine national Sampaoli, who had never previously managed an international team or any club outside of South America prior to his appointment in 2012, was seen as a big gamble by the Chilean press three years back. However, over the years, he has completely rejuvenated the side, turning Chile into one of the most feared teams from the continent. With his nation of birth Argentina, in the way of the Copa title, Sampaoli will hope to lead his team across the final hurdle, and bring Chile's first-ever major trophy. Led by Barcelona stalwart Lionel Messi, the Argentine team boasts of one of the best attacking line-ups in the world. With the likes of Angel di Maria, Sergio Aguero, Gonzalo Higuain, Carlos Tevez and Javier Pastore in their ranks as well, Argentina, on their day, can pick apart any team in the world. The Albiceleste, however, hasn't had a particularly impressive campaign at the Copa. They looked sloppy in the group stages, and almost got knocked out in the quarter finals against Colombia, but managed to sneak past the round through penalties. In the semi-final, it was a different story altogether. The much-hyped attack finally clicked, and Paraguay were demolished by a scoreline of 6-1, with Messi picking up three assists and Di Maria scoring twice. Against a strong Chile side, which will have the home crowd behind it, it is unlikely to be anywhere near as easy for Argentina on Saturday. The Argentine side revolves around Messi, who has slotted in at a slightly withdrawn attacking role in this tournament. The likes of Di Maria, Aguero and Tevez are potential game-changers, and could be crucial in unlocking the well-organised Chilean defence. Midfielder Javier Mascherano is in good form as well, and will be playing in his favoured holding midfield position. For Chile, Eduardo Vargas has been brilliant throughout the competition, scoring four goals in their five games so far. Juventus star Arturo Vidal, who has been used in a more advanced role in midfield, has been very effective in all the games as well. Charles Aranguiz and Alexis Sanchez are two more very potent attacking threats. 2015 Copa America final on Indian television: Sunday, July 6, at 1.15 am on Sony Kix. TWEET THIS Will Lionel Messi's Argentina come out on top in the #CopaAmerica final? Or will Chile have the last laugh? 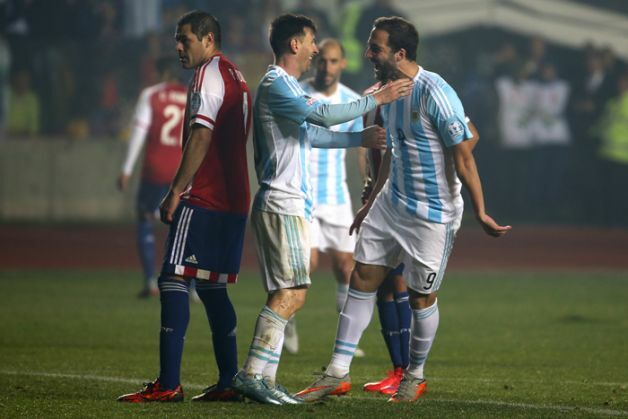 Hosts Chile stand in the way of a record-equalling 15th #CopaAmerica title for Argentina.